Royalty Free Stock photos by DW Stock Picture Library, Australian Photo Images. 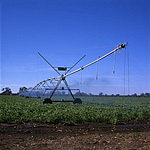 IRRIGATING POTATO CROP USING A LINEAR SPRINKLER ON MID-TERM CROP, SOLANACEAE. All the images on this website are under the © copyright of The DW Stock Picture Library and may not be reproduced without our permission, please email us on permission.